Let’s make some great fudge that’s so easy even a child could do it. 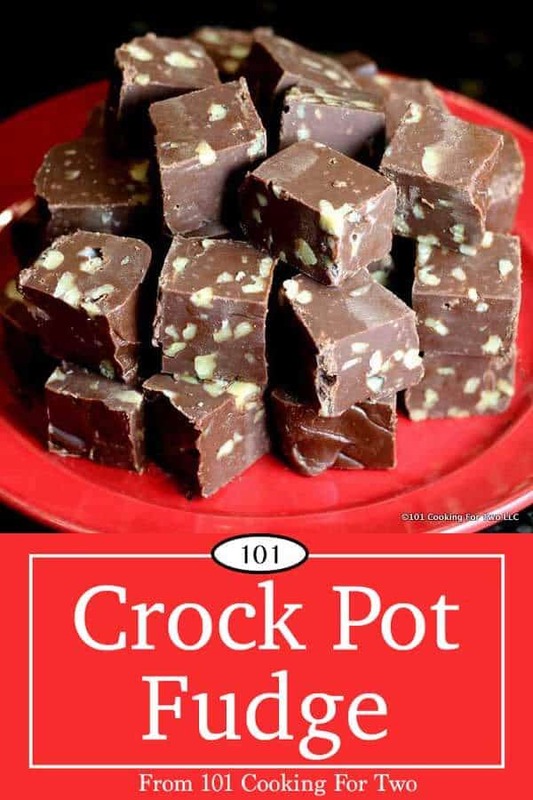 This crock pot fudge recipe is just what you need for the holidays. I love a little fudge, and it is that time of the year. I just need little, not a lot; just a little fudge will do. 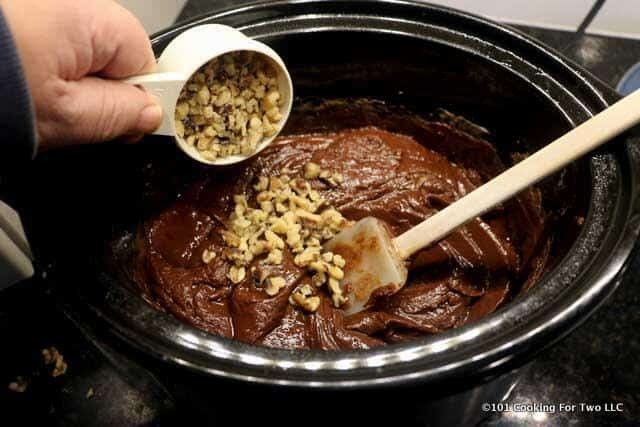 A slow cooker is perfect for making fudge because it doesn’t scorch or burn at least on low. 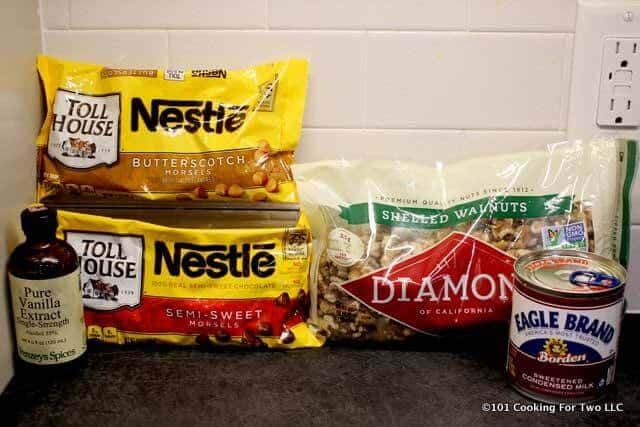 So with this recipe, you can add your choice of nuts like I did. You could top with candies like sprinkles, M&M’s, or Reese’s Pieces. A nice 5. There is better fudge, but this is very nice. 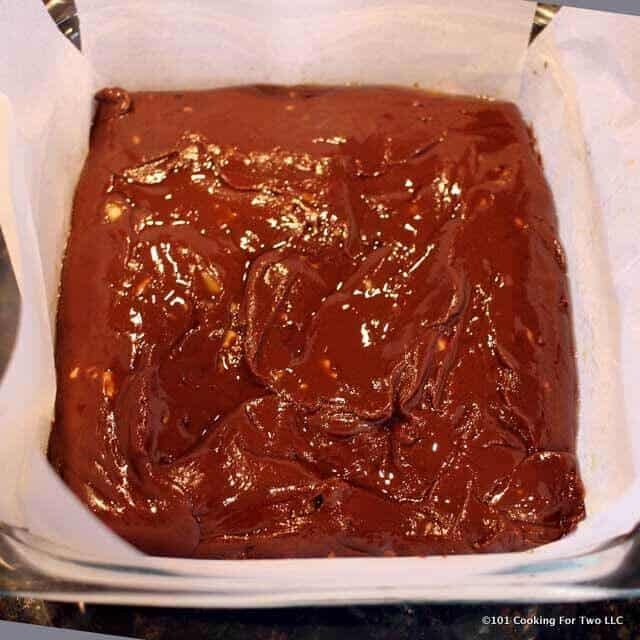 There are lots of slow cooker fudge recipes out there. There were very few surprises. 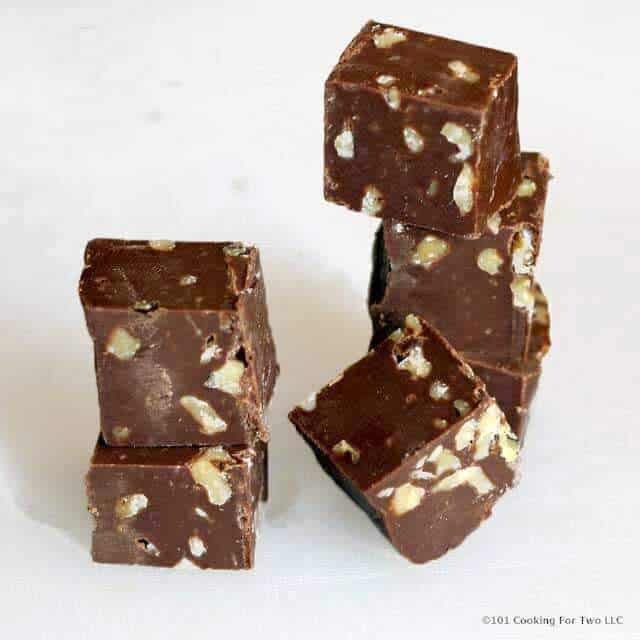 There are recipes that are far from the mainstream, but most use chocolate chips and sweetened condensed milk like my 5 Minute Fudge. The first and most obvious thing about this recipe is cooked in an open crock pot with the top off. Yep, no top. Why you ask? Water is the enemy of fudge, and with the top off, all moisture is vented. 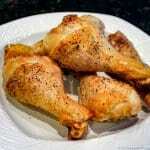 Several recipes (usually British if I remember) were very emphatic about this, and I believe they were right. Just leave the top off. Your slow cooker will be slower, but that is fine. I tried just leaving it ajar, and it was not the same. Moisture still accumulated on the lid and dripped back in. Low Vs. High on the Crock Pot. Why low for the fudge? Can I just turn it up since I have the top off? 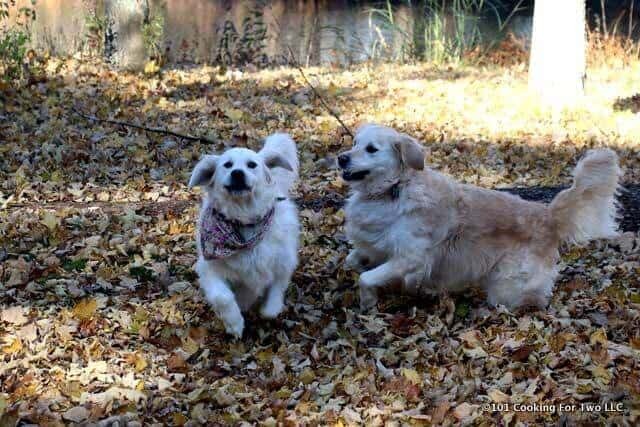 No, please don’t do that. On low, most crock pots are about 200 degrees. 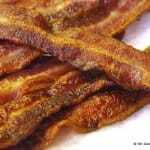 On high, some crock pots may run up to 250 degrees. They shouldn’t, but some do. That is just too high for fudge and will ruin the texture. If you want to hover over the crock pot, stir frequently and stop when it is melted, you can use high. But with low, you can dump and come back later. Even if you skip the stirring, it should be fine. So the recipe gives an option to use two bags of semisweet chocolate chips or one bag of chocolate and one bag of butterscotch chips. 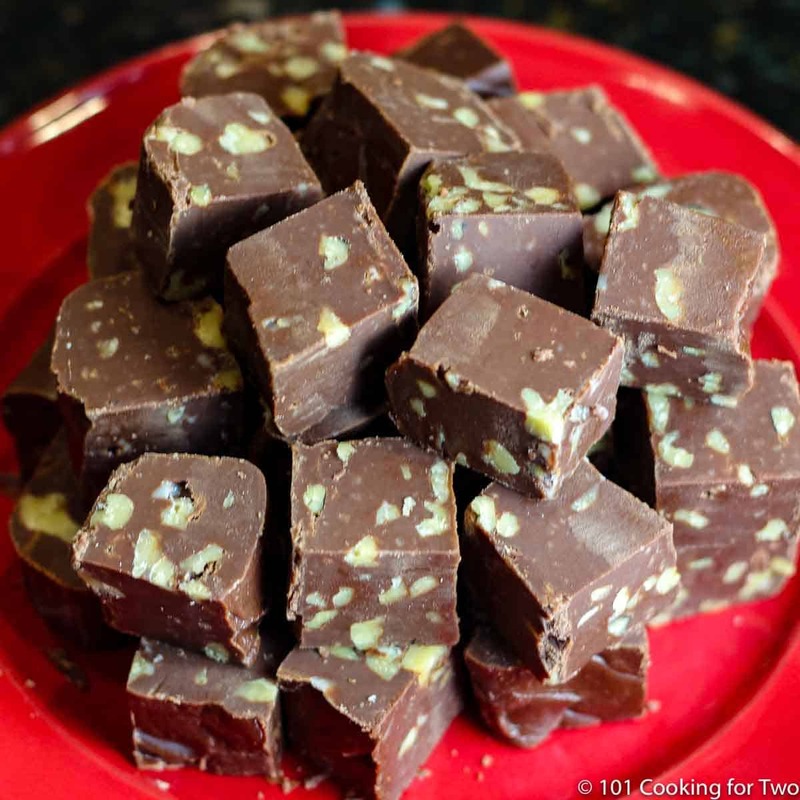 While all the other recipes use just chocolate, I like my fudge with some butterscotch. But the butterscotch doesn’t melt quite like the chocolate chips. It likes to maintain its shapes even when melted. When doing a stovetop fudge like my 5 Minute Fudge, you are standing there stirring the pot but not so much here. So the answer is fairly simple, stir well several times and at the end stir aggressively and mush any remaining chips against the side to make it combine with the chocolate. Not hard but just be aware of it. Also, I would not even try the generic butterscotch chips. I used an 8-inch square pan. A 9-inch would also be fine. Or make a wreath like my Easy Fudge. 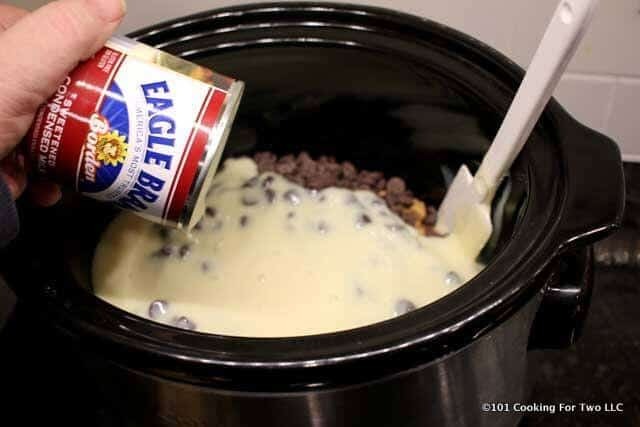 This recipe is just right in my 3.5-quart crock pot but could use a bigger pot. It might melt a little faster. You need to have the chocolate melted well, and if using butterscotch chips, they need to be soft enough to combine. So you need to know your pot and pay attention. Start with a smaller crock pot. 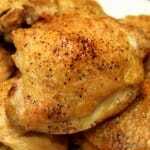 I used a 3.5-quart cooker. But a larger crock pot will be fine. Give it a heavy spray of PAM. 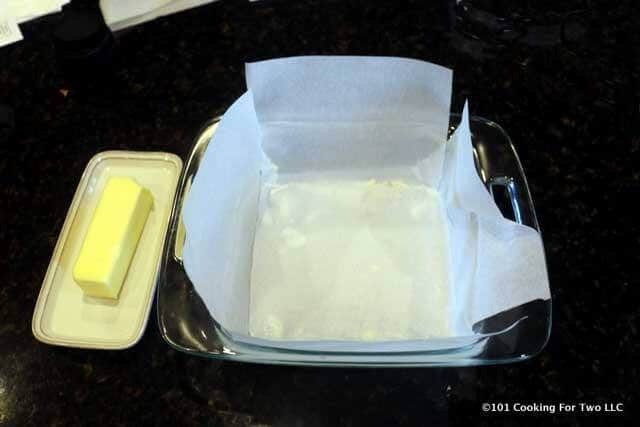 Prep an 8 by 8 or 9 by 9 pan with crossing sheets of parchment paper. Also butter corners well to prevent sticking. I like to just a touch of butter under the parchment paper to hold it in place. You can just butter the dish if you wish. If you do this then after cooled, set in warm water for a few minutes to release the fudge. Pour into the prepared pan and smooth. You may add other toppings at this time. Refrigerate until firm (at least 2 hours). Can this recipe be doubled? 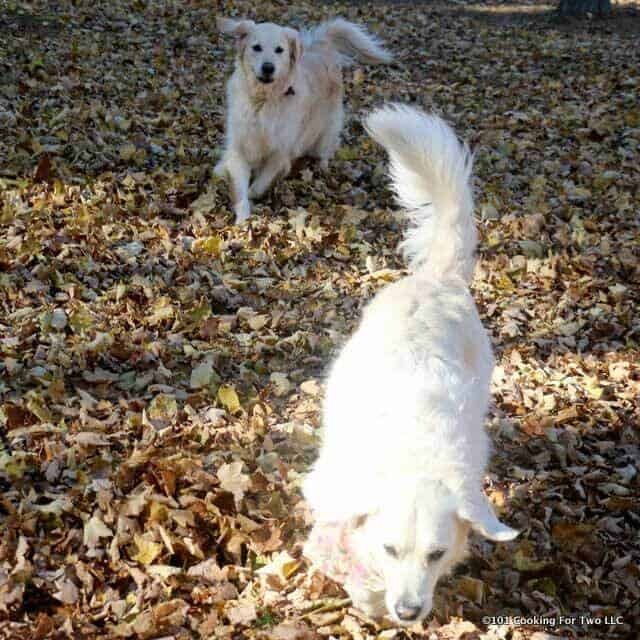 Using a 9×13 pan? Yep, it will double fine and a 9X13 pan works great. What adjustments do you recommend for a 1.5qt crock pot? I would probably not do it or cut it in half. The crock pot will be almost full which is too full to work well. 60-70% full is usually max. I think you will be at about 80-90% plus. 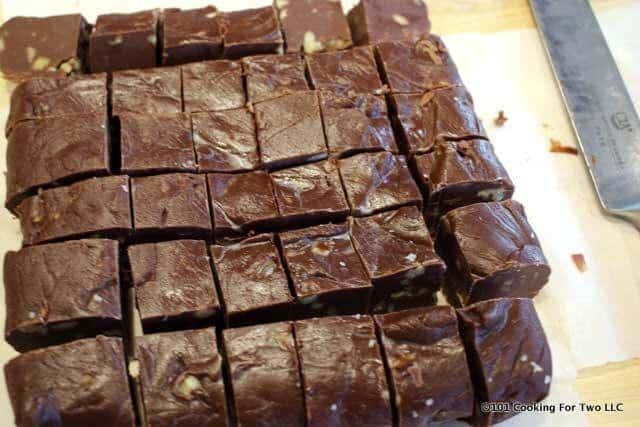 You can make this fudge in the microwave in 2 min. I thought it would be a good one to do with kids especially with the lid off so they could see things. I didn’t have a convenient 4 yr old to run a trial though. I do like the butterscotch chips in the fudge but it does take a little work at the end.